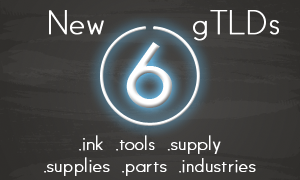 Beginning 25 June, six additional new gTLDs will enter the General Availability phase. Those include: .INK, .TOOLS, .SUPPLY, .SYPPLIES, .PARTS and .INDUSTRIES. Businesses and organisations as well as individuals interested in any of the above mentioned domains can register domain names on a first come, first served basis with no restrictions. If you wish to register a domain name, click on the domain of your choice. For questions or further assistance, contact our Support Team at support@web-solutions.eu or via phone on +44 (0) 208 133 3994.